Last weekend, a friend and I met for tea and scones in a lovely country pub close to where I live. As we entered, the hostess – Holly – greeted me warmly by name, and found us a comfy sofa to sit on, despite it being really busy, and throughout the time we spent there, made me feel an important and special customer. My friend was wearing a very distinctive necklace; ornate and individual. She told me she bought it from a little jewellery shop in a nearby town that she always goes to. She explained that they know her by name in there, and that they call her if they are going to have a sale. Not only that, but they also give her a small goodwill discount on everything she buys, just to say ‘thank you’. Giving your clients the red carpet treatment is the best business decision you will ever make. Research conducted by Accenture last year found that 51% of us switch brands after getting poor service. It’s not something that most of us put up with, and why should we? I mean it. It seems to me that not enough companies appreciate their customers. If they do, most don’t let their customers know it. I have always marched to the beat of my own drum, so I wanted you to know that at the Ronning Compound, you are very much appreciated. In addition, should you need anything, don’t hesitate to contact us. We are here for you, and committed to customer service excellence and satisfaction. I look forward to a long and mutually beneficial relationship. What a fantastic letter! I know that he sends out a letter like this to everyone, but that’s not the point. He sent it to me, and made me feel really good about my purchase. And he did it by letter, delivered by a real postman, on beautiful watermarked paper. When was the last time you got one of those? It’s not actually that hard to make a customer feel really special. As estate agents, you have access to your clients’ lives that most companies will never have. You get to walk around their homes – their bedrooms – and chat to them at length about their families, their holidays, hopes and dreams, good times and bad. That level of intimacy is very precious, and it’s a privilege to be let into someone’s life like this. In my recent post The most important question you can ask a vendor I discuss the importance of listening closely to your clients. There are so many nuggets of opportunity in a good conversation with a prospective vendor or landlord, and I’m not talking about opportunities to sell, but opportunities to surprise and delight. Perhaps in conversation you learn about their favourite restaurant, shop or band. Can you present them with a voucher, just to say thank you for their business? Maybe they have children who love horseriding, fishing, or even the X Factor. Could you give them something small but meaningful, that means the most to them? I’m delighted when the pub’s hostess, Holly, gives my dog a biscuit. If she knew my daughter loved McFly (she does) and gave me a mug to give to her, I’d be blown away. The red carpet treatment doesn’t have to be expensive, time consuming or onerous. It just needs to be thoughtful. It can be something as simple as emailing a link to a rug sale, because they had mentioned they needed a new one; or calling them with a recommendation for a gardener, babysitter or car valeting company, when they need their services. Because not only do you know a huge amount about their lives, you also have a wealth of connections in your area. You are in a perfect position to make a difference – however small – to the lives of the people in your community, quickly and easily, when they need it most. So here’s my question for you: what are you going to do today to show genuine appreciation to the people who have chosen to do business with you, and those who have not yet decided? This is no ‘one size fits all’ – you need to think about what would mean the most to them. And it’s not just your clients that need appreciation – it’s the people who refer you, your business neighbours, and of course, the most important people in your business – your employees. They all need giving the red carpet, and when you do, you’ll create goodwill and Karma, and keep them loyal and happy for many years to come. Red carpet treatment is not a luxury in business today – it’s a necessity if you want to stand out from the crowd, prove differentiation, and sell on quality of service, not pathetically low fees. 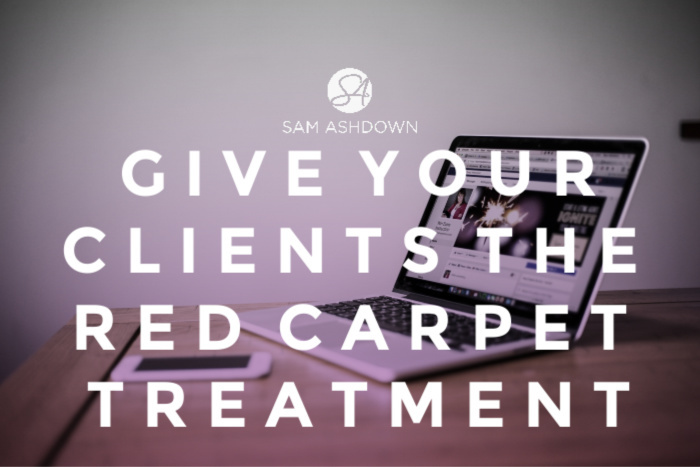 And remember – if you don’t give your clients the red carpet treatment, someone else will. All so true, and it’s amazing how good things come back to you at a latter date. If you just give a little of yourself. Of course the only hard bit is managing the other 101 priorities in your biz/life at the same time. The power of recognition is awesome. Thanks Paul, you’re so right. And the little things that mean so much will keep you in their hearts and minds for many years to come! I totally agree, showing your clients you’ve listened to them and taken a genuine interest means a lot to people. Having a read over your very interesting articles, I just had to express my appreciation towards your sensible approach in dealing with, people ! not clients or leads. It means a lot to be able and keep your heart warm in dealing with people, in business, after years of experiences in real estate. This comes from an independent estate agent that worked in more countries and got his heart a bit poisoned by dealing with thousands of people along the road. Congratulations to you Sam!